Nissan Super GT young stars Jann Mardenborough and Daiki Sasaki were cruelly robbed of their first GT500 win together as teammates after dominating 94 laps of the Fuji 500 mile race yesterday. After starting fifth on the grid, Sasaki moved up to fourth in his opening stint before handing over to Mardenborough. Quick pit work gained the duo another spot, and the former Nissan GT Academy winner then charged his way to the race lead on lap 55, passing the No.23 Motul Autech GT-R of Tsugio Matsuda. From that point forward, the No. 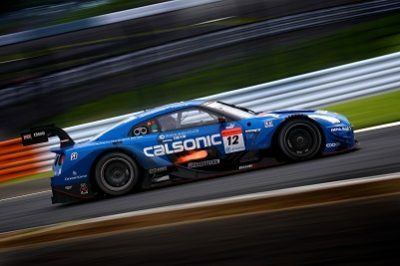 12 Calsonic GT-R dominated the race with Mardenborough and Sasaki stretching their lead to more than 20 seconds. Mardenborough completed his final stint on lap 143 of 177 to hand over to Sasaki. Sadly, six laps later, the Japanese driver had to return to the pits after losing pace. What had looked like a certain victory, turned to despair. The Team IMPUL car resumed on track after repairs but was two laps down at the finish. Nissan had entered the race in high spirits after dominating qualifying with four of the Nissan GT-R NISMO GT500s filling the top five spots on the grid including Tsugio Matsuda and Ronnie Quintarelli on pole. In the race, however, the No. 23 GT-R suffered from tire degradation and was forced to make one additional pitstop, taking them out of contention for the race win. The Japanese/Italian combination took the checkered flag in ninth place. Front-row starters JP de Oliveira and Mitsunori Takaboshi scored the best race finish for Nissan in sixth place. “We began on the front row so I thought we could make it to the podium and I was aiming to be in the fight for victory,” de Oliveira said. The No. 3 GT-R of Satoshi Motoyama and Katsumasa Chiyo started fourth but suffered an off-track excursion and eventually retired with a transmission issue on lap 139. The next round of the Super GT championship will be at Sportsland Sugo on September 15-16. Nissan Motorsport ace Rick Kelly scored a sixth-place finish as Australian fans enjoyed the first nighttime Supercars race to be held for more than 20 years. The No. 15 Altima driver continued his strong 2018 qualifying form earlier in the day by lining up fourth on the grid. A difficult first stint was compounded with a slow puncture in his second run before Kelly demonstrated the improved race pace of the Nissan to cross the line in sixth place. Kelly has also now solidified his position inside the Top 10 on championship points. “Sixth was pretty good for us. One thing we had been working hard on lately was our race pace, and I think we achieved that,” Kelly said. “Even though it’s cold and at night, tire degradation around this place is still pretty significant. So we had a big swing at the race package, and the last stint proved we made some good in-roads there. Simona de Silvestro completed the race in 14th place while teammates Michael Caruso and Andre Heimgartner’s races were both ruined following contact. Caruso delivered a strong qualifying performance to line up inside the top 10 but was taken out late in the race by Anton de Pasquale who received a points penalty for the contact. Heimgartner suffered contact with Garth Tander early in the race, and the suspension damage and repairs cost him multiple laps. The Nissan-powered ESM squad delivered a strong fightback finish for Pipo Derani and Johannes van Overbeek at Road America after suffering a dramatic fire on the first lap of practice on Friday. Derani had to quickly exit his car on Friday after a fuel-related fire in Friday practice. The No. 22 entry was extensively damaged, and the crew worked overnight to return the car to the track for Saturday’s qualifying session. While pace eluded the team in qualifying, the Brazilian ended up topping the times in Sunday’s warm-up session. In a dramatic race decided on fuel strategy, Derani climbed as high as second with 30 minutes to go in the race before having to make a stop for fuel. Fast times at the finish pushed the Nissan-powered Onroak car back up to sixth at the flag. Ryan Dalziel and the No. 2 Nissan Onroak DPi, on an alternate fuel strategy, finished in ninth position. “It was such a difficult weekend for us. We had a fire in practice one and missed all of Friday,” Derani said. “After a great job by our crew to repair everything, we managed to get some laps in on Saturday. We started at the back of the grid and finished sixth, which was a good finish for us after starting second from last. RJN Motorsport’s Nissan 370Z GT4 pairing of Martin Plowman and Kelvin Fletcher are only three points off the British GT Championship GT4 Pro-Am Championship lead after a strong performance at Brands Hatch. The duo finished third in GT4 and second in the Pro-Am class on the weekend to remain in contention for the title with only one round remaining at Donington Park on September 22-23. Plowman – the 2013 FIA WEC LMP2 championship winner – has starred in the GT4 class aboard the Nissan 370Z GT4 this year teamed with Pro-Am driver Kelvin Fletcher. Fletcher is an award-winning British actor who starred in the UK television soap opera “Emmerdale” from 1996–2016.